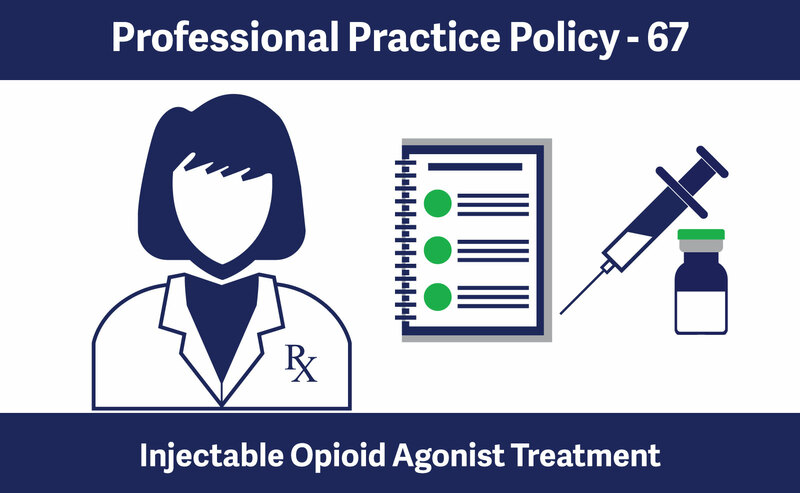 New Professional Practice Policy for Injectable Opioid Agonist Treatment and an accompanying policy guide will come into effect on September 1, 2018. At its June 2018 meeting, the College Board approved the implementation of Professional Practice Policy-67 for Injectable Opioid Agonist Treatment, as well as an accompanying Policy Guide for Injectable Hydromorphone Maintenance Treatment. These documents set out requirements for the safe dispensing of injectable hydromorphone for the treatment of opioid use disorder. While the College currently has requirements in place for buprenorphine/naloxone, methadone and slow release oral morphine when used for oral opioid agonist treatment, the College does not yet have specific requirements regarding the dispensing of iOAT drugs. With community pharmacies starting to offer treatments to patients affected by opioid use disorder, including supervised self-injection of hydromorphone, new requirements for the safe dispensing of these drugs is needed to protect patient safety. The BCCSU is a provincially networked organization with a mandate to develop, help implement, and evaluate evidence-based approaches to substance use and addiction. The BCCSU’s “A Guideline for the Clinical Management of Opioid Use Disorder,” was released on June 5, 2017 and provided practice guidance for those involved in the administration of oral opioid agonist treatments (OAT) (i.e. buprenorphine/naloxone, methadone and slow release oral morphine) to treat patients with opioid use disorder. Opioid agonist treatment is an effective treatment for substance use disorder of opioid drugs such as heroin, oxycodone, fentanyl and Percocet. The treatment involves taking either oral or injectable opioid agonists such as buprenorphine/naloxone, methadone, or slow-release oral morphine, or injectable hydromorphone in order to manage withdrawal and cravings for opioid drugs. The College’s new Professional Practice Policy for Injectable Opioid Agonist Treatment sets out requirements for community pharmacies and registrants that provide pharmacist supervision of injectable hydromorphone maintenance treatment. As part of the implementation of Professional Practice Policy-67, the College developed a new policy guide for Injectable Hydromorphone Maintenance Treatment. The guide outlines required principles and guidelines that must be applied by pharmacy managers, staff pharmacists, relief pharmacists and pharmacy technicians employed in a community pharmacy that provides pharmacist supervision of injectable hydromorphone.